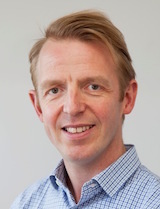 Richard Simcock is Clinical Oncologist based at the Sussex Cancer Centre in Brighton, UK. Having trained in London, the South East of the UK and a Fellowship in Sydney, Australia he has been a Consultant at the Brighton and Sussex University Hospitals NHS Trust for 10 years. He treats patients with breast and head and neck cancers. He is a member of the Royal College of Radiologists, European Society of Therapeutic Radiation Oncology and the British Institute of Radiology but is more interested in how modern media can spread learning and deepen understanding in medical care.